[S174] Bert Waters, Waco, Tex., interview by Roger Bartlett, 29 Jun 1974 (naming Carrie Waters as her mother). [S356] Bryan E. Couch, electronic mail to Roger Bartlett, 19 Jan 1998 (giving the date but not naming the place). [S740] Nancy Lovett, electronic mail to Roger Bartlett, 4 May 2002. [S872] Odessa American, Odessa, Tex., online http://www.oaoa.com/obit/deaths101903.htm, 19 Oct 2003, viewed 19 Oct 2003 (obituary of Nelle Lovett) (stating she was born in Pauls Valley, Oklahoma without giving the date). [S868] Nancy Lovett, electronic mail to Roger Bartlett, 18 Oct 2003. [S872] Odessa American, Odessa, Tex., online http://www.oaoa.com/obit/deaths101903.htm, 19 Oct 2003, viewed 19 Oct 2003 (obituary of Nelle Lovett). [S872] Odessa American, Odessa, Tex., online http://www.oaoa.com/obit/deaths101903.htm, 19 Oct 2003, viewed 19 Oct 2003 (obituary of Nelle Lovett) (stating that burial would be at the Garden of Prayers). [S67] The Dallas Morning News, Dallas, Tex., 14 Dec 1981, sec. B, p. 40 (obituary of Fleming Aiken Waters) (stating that she lived in Odessa, Texas). [S174] Bert Waters, Waco, Tex., 29 Jun 1974 interview, above (stating that she lived in Odessa, Texas). [S791] Hood County News, Granbury, Tex., online http://www.hcnews.com, 3 Dec 2002, viewed 3 Dec 2002 (obituary of John F. Waters, Sr.) (stating that she lived in Odessa, Texas). [S872] Odessa American, Odessa, Tex., online http://www.oaoa.com/obit/deaths101903.htm, 19 Oct 2003, viewed 19 Oct 2003 (obituary of Nelle Lovett) (stating that she was a retired teacher and lived in Odessa, Texas and identifying her survivors). [S174] Bert Waters, Waco, Tex., interview by Roger Bartlett, 29 Jun 1974 (naming Carrie Waters as his mother). [S58] Index to Texas Birth Records (Austin, Tex. : Tex. Dept. of Health, Bur. of Vital Statistics), typescript 1912, vol. 2, p. 846, file 21142 (not giving his name but identifying him as "Inf. of D. E. Waters"). [S11] Index to Texas Death Records (Austin, Tex. : Tex. Dept. of Health, Bur. of Vital Statistics), typescript, 1978 (microfiche), p. 1832, file 52013-78. [S312] Social Security Death Index, online at http://tinyurl.com/AncestrySSDI, viewed on 7 Apr 1998 (giving his name as Ted Waters; stating that he died in Jun 1978; not naming the place of death but stating that he lived in Cisco, Texas when he died). David Elam Waters, Jr.'s tombstone, Travelers Rest Cemetery, Sampson, Ala., courtesy of Deborah Broxson. Note*: • He lived in the Los Angeles area. [S961] Find A Grave, online, above, memorial for David Elam Waters, Jr., memorial no. 35819518, viewed on 22 Jul 2017 (naming Nancy Caroline Bartlett Waters as his mother). [S356] Bryan E. Couch, electronic mail to Roger Bartlett, 19 Jan 1998 (giving the date but not the place). [S312] Social Security Death Index, online at http://tinyurl.com/AncestrySSDI, viewed on 20 Jan 1998 (giving the date but not the place). [S961] Find A Grave, online, above, memorial for David Elam Waters, Jr., memorial no. 35819518, viewed on 22 Jul 2017. [S961] Find A Grave, online, above, memorial for Merle Sellers Waters, memorial no. 35819536, viewed on 22 Jul 2017. [S312] Social Security Death Index, online at http://tinyurl.com/AncestrySSDI, viewed on 20 Jan 1998 (not naming the place of death but stating that he lived in North Hollywood, California when he died). [S961] Find A Grave, online, above, memorial for David Elam Waters, Jr., memorial no. 35819518, viewed on 14 Mar 2012. [S174] Bert Waters, Waco, Tex., 29 Jun 1974 interview, above (first bullet). [S67] The Dallas Morning News, Dallas, Tex., 14 Dec 1981, sec. B, p. 40 (obituary of Fleming Aiken Waters) (first bullet). [S961] Find A Grave, online, above, memorial for David Elam Waters, Jr., memorial no. 35819518, viewed on 22 Jul 2017 (citing "U.S. World War II Army Enlistment Records, 1938-1946") (second bullet). 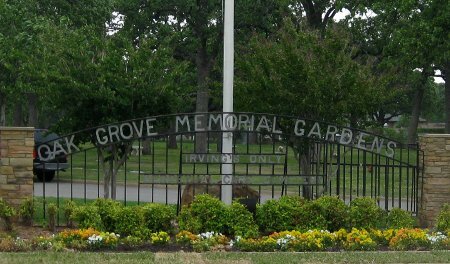 Oak Grove Memorial Gardens, Irving, Tex., courtesy of RC Karnes. [S961] Find A Grave, online at http://www.findagrave.com, memorial for Marien A. Waters, memorial no. 7383833, viewed on 13 Aug 2011 (giving the year but no other details). [S174] Bert Waters, Waco, Tex., 29 Jun 1974 interview, above (stating that he died about 1971). [S312] Social Security Death Index, online at http://tinyurl.com/AncestrySSDI, viewed on 7 Apr 1998 (stating that he died in Mar 1971; not naming the place of death but stating that she lived in Irving, Texas when he died). [S961] Find A Grave, online, above, memorial for Marien A. Waters, memorial no. 7383833, viewed on 13 Aug 2011 (not giving the date). [S174] Bert Waters, Waco, Tex., 29 Jun 1974 interview, above (stating that he lived in Irving, Texas). Elizabeth Julia Waters, courtesy of Libbye Howard Baca. [S356] Bryan E. Couch, electronic mail to Roger Bartlett, 19 Jan 1998 (stating that she was born on 25 Jan 1918 without naming the place). [S312] Social Security Death Index, online at http://tinyurl.com/AncestrySSDI, viewed on 27 Sep 2002 (stating that she was born on 25 Jan 1918 without naming the place). [S1366] Libbye Howard Baca, Facebook message to Roger Bartlett, 19 Nov 2016. [S174] Bert Waters, Waco, Tex., 29 Jun 1974 interview, above (not giving the date or place). [S740] Nancy Lovett, electronic mail to Roger Bartlett, 4 May 2002 (not giving the date or place). [S740] Nancy Lovett, electronic mail to Roger Bartlett, 4 May 2002 (stating that she died in Jan 2002 in Houston, Tex.). [S312] Social Security Death Index, online at http://tinyurl.com/AncestrySSDI, viewed on 27 Sep 2002 (stating that she died on 9 Jan 2002; not naming the place of death but stating that she lived in Houston, Tex. when she died). [S961] Find A Grave, online at http://www.findagrave.com, memorial for Elizabeth Howard, memorial no. 41123731, viewed on 21 Dec 2016. [S67] The Dallas Morning News, Dallas, Tex., 14 Dec 1981, sec. B, p. 40 (obituary of Fleming Aiken Waters). [S174] Bert Waters, Waco, Tex., 29 Jun 1974 interview, above (stating that she was living in Abilene, Tex.). [S312] Social Security Death Index, online at http://tinyurl.com/AncestrySSDI, viewed on 27 Sep 2002 (stating that she lived in Houston, Tex. when she died). Dale E. Howard, courtesy of Libbye Howard Baca. "Services will be held today for Dr. Dale Elmo Howard, a one-time assistant superintendent of schools in Travis County, who was a lifelong Texas educator active in state Democratic politics. "Howard suffered a heart attack Tuesday. He was 71. "Rev. Lujet McCullough of St. David’s Community Hospital will officiate at services at 11 a.m. at the Cook-Walden Funeral Home. Burial will be at Austin Memorial Park. "Until 1979, Howard taught part-time at St. Edward’s University, capping a lengthy career in Texas education that began as a teacher in Commanche [sic] County in 1931. There, he also rose to the position of school superintendent before assuming the vice presidency of C.C. Porter, a Dallas textbook sales company. [S174] Bert Waters, Waco, Tex., interview by Roger Bartlett, 29 Jun 1974 (not giving the date or place). [S124] Austin American-Statesman, Austin, Tex., 22 Sep 1983, p. B2, cols. 2-3 (obituary of Dr. Dale Elmo Howard) (stating that he died of a heart attack). [S961] Find A Grave, online at http://www.findagrave.com, memorial for Dale Elmo Howard, memorial no. 41123735, viewed on 21 Dec 2016 (giving the date but not the place). [S124] Austin American-Statesman, Austin, Tex., 22 Sep 1983, p. B2, cols. 2-3 (obituary of Dr. Dale Elmo Howard). [S961] Find A Grave, online, above, memorial for Dale Elmo Howard, memorial no. 41123735, viewed on 21 Dec 2016 (not giving the date). [S124] Austin American-Statesman, Austin, Tex., 22 Sep 1983, p. B2, cols. 2-3 (reprinted here with consent of the Austin American-Statesman). 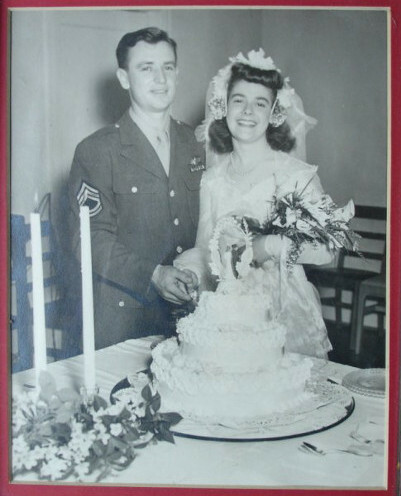 Wedding day, 3 Apr 1945, courtesy of Betsy Waters Haynes. Other Names*: John Waters, Johnny Waters. [S791] Hood County News, Granbury, Tex., online http://www.hcnews.com, 3 Dec 2002, viewed 3 Dec 2002 (obituary of John F. Waters, Sr.). [S961] Find A Grave, online at http://www.findagrave.com, memorial for John F. Waters, Sr., memorial no. 117022667, viewed on 22 Jul 2017 (giving the date but not the place). [S312] Social Security Death Index, online at http://tinyurl.com/AncestrySSDI, viewed on 26 Dec 2003 (stating that he died in Sep 1966; not naming the place of death but stating that he lived in Granbury, Tex. when he died). [S67] The Dallas Morning News, Dallas, Tex., 14 Dec 1981, sec. B, p. 40 (obituary of Fleming Aiken Waters) (stating that he resided in Irving). [S174] Bert Waters, Waco, Tex., 29 Jun 1974 interview, above (stating that he had seven children). [S791] Hood County News, Granbury, Tex., online http://www.hcnews.com, 3 Dec 2002, viewed 3 Dec 2002 (obituary of John F. Waters, Sr.) (stating that he lived in Granbury, Tex., that he served in the U.S. Army Air Corps and was a retired building inspector for the City of Dallas, and identifying his survivors). [S791] Hood County News, Granbury, Tex., online http://www.hcnews.com, 3 Dec 2002, viewed 3 Dec 2002 (obituary of John F. Waters, Sr.) (naming John F. Waters, Sr. as his father). [S791] Hood County News, Granbury, Tex., online http://www.hcnews.com, 3 Dec 2002, viewed 3 Dec 2002 (obituary of John F. Waters, Sr.) (naming John F. Waters, Sr. as her father). [S58] Index to Texas Birth Records (Austin, Tex. : Tex. Dept. of Health, Bur. of Vital Statistics), typescript (naming John Francis Waters as her father). [S1498] Obituary of Barbara Waters Scott, Legacy Funeral Home, Arizona, 24 Aug 2018, online at http://azlegacyfuneralhome.com/obituaries/?id=143, viewed on 24 Aug 2018 (naming John Waters as her father). [S58] Index to Texas Birth Records (Austin, Tex. : Tex. Dept. of Health, Bur. of Vital Statistics), typescript 1919, vol. 3, p. 1238, file 53717. [S356] Bryan E. Couch, electronic mail to Roger Bartlett, 19 Jan 1998 (giving only the date). [S312] Social Security Death Index, online at http://tinyurl.com/AncestrySSDI, viewed on 8 Sep 2002 (giving only the date). [S312] Social Security Death Index, online at http://tinyurl.com/AncestrySSDI, viewed on 8 Sep 2002 (not naming the place of death but stating that he lived in Riverside, Calif. when he died and that last benefits were sent to an address in Riverside, Calif.). [S67] The Dallas Morning News, Dallas, Tex., 14 Dec 1981, sec. B, p. 40 (obituary of Fleming Aiken Waters) (stating that he was living in Los Angeles, Calif.). [S174] Bert Waters, Waco, Tex., 29 Jun 1974 interview, above (stating that he was living in Anaheim, Calif. in 1974). [S312] Social Security Death Index, online at http://tinyurl.com/AncestrySSDI, viewed on 8 Sep 2002 (stating that he lived in Riverside, Calif. when he died on 15 Mar 1998). [S762] Betsy Waters Mineo, electronic mail to Roger Bartlett, 3 Sep 2002 (naming James Waters as her father). 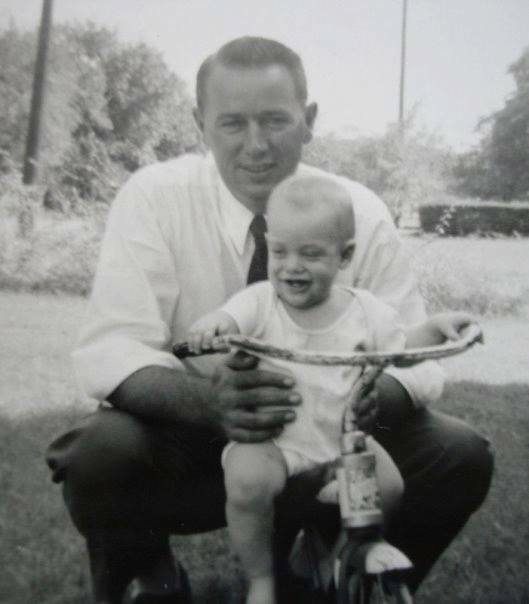 William Eugene ('Billy') Waters with a nephew, courtesy of Betsy Waters Haynes. [S312] Social Security Death Index, online at http://tinyurl.com/AncestrySSDI, viewed on 7 Apr 1998 (giving the date but not the place). [S961] Find A Grave, online at http://www.findagrave.com, memorial for William Eugene Waters, memorial no. 117022826, viewed on 22 Jul 2017. [S312] Social Security Death Index, online at http://tinyurl.com/AncestrySSDI, viewed on 7 Apr 1998 (stating that he died in Jun 1980; not naming the place of death but stating that he lived in Dallas, Texas when he died and that last benefits were sent to an address in San Antonio, Texas). [S790] Nancy Lovett, electronic mail to Roger Bartlett, 1 Dec 2002 (naming the city but not the cemetery). [S174] Bert Waters, Waco, Tex., interview by Roger Bartlett, 29 Jun 1974 (not giving the date). [S1061] Houston Chronicle, Houston, Tex., online chron.com, 3 Dec 2005 (obituary of Patti Ruth Maloney Linbeck) (naming Andrew James Maloney as her father). 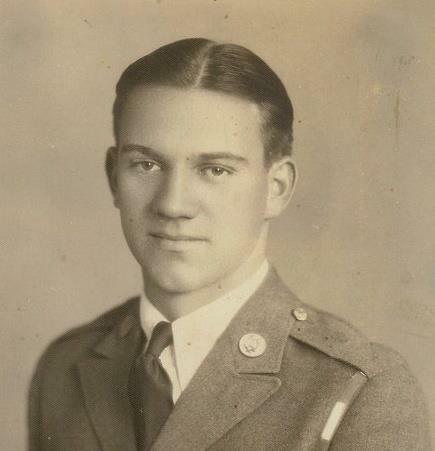 [S973] Edward L. Williams, message on Navarro County, Texas message board, online, http://boards.ancestry.com, 8 Jun 2004, (spelling his name as Markgraff). [S975] Paula Sain, message on Navarro County, Texas message board, online, http://boards.ancestry.com, 7 Jun 2004, (stating that he was born in 1860 in Germany). [S15] Navarro County, Texas Marriages, vol. 2, 1889-1899 (Corsicana, Tex. : The Navarro County Gen. Soc'y, 1987), p. 105 (citing Navarro County, Texas Marriage Records, vol. VI, p. 38) (misspelling his surname as Markgroff). [S975] Paula Sain, message on Navarro County, Texas message board, online, http://boards.ancestry.com, 7 Jun 2004, citing 1900 U.S. Census, Navarro Co., Tex. [S975] Paula Sain, message on Navarro County, Texas message board, online, http://boards.ancestry.com, 7 Jun 2004, (naming George F. Markgraff [sic] as her father). [S961] Find A Grave, online at http://www.findagrave.com, memorial for Augusta Markgraff Belden, memorial no. 115049521, viewed on 20 Aug 2013 (naming George K. Markgraff as her father). [S961] Find A Grave, online, above, memorial for Frederick McKamy Markgraff, memorial no. 43773985, viewed on 11 Feb 2013 (naming Geo. F. Markgraff as his father). [S975] Paula Sain, message on Navarro County, Texas message board, online, http://boards.ancestry.com, 7 Jun 2004, (naming George F. Markgraff as her father). [S961] Find A Grave, online, above, memorial for Beatrice Markgraff, memorial no. 115414394, viewed on 20 Aug 2013 (naming Ira Markgraff as her father). [S975] Paula Sain, message on Navarro County, Texas message board, online, http://boards.ancestry.com, 7 Jun 2004, citing 1900 U.S. Census, Ellis Co., Tex. (giving her age as 30). [S15] Navarro County, Texas Marriages, vol. 2, 1889-1899 (Corsicana, Tex. : The Navarro County Gen. Soc'y, 1987), p. 104 (citing Navarro County, Texas Marriage Records, vol. VI, p. 13). Other Names*: J. W. McConnico, James McConnico. [S961] Find A Grave, online at http://www.findagrave.com, memorial for James Washington McConnico, memorial no. 10368374, viewed on 8 Feb 2013. [S189] Navarro County Cemetery Records, vol. 9 (Corsicana, Tex. : The Navarro County Gen. Soc'y, 1989), p. 101. [S961] Find A Grave, online, above, memorial for Roscoe McConnico, memorial no. 64926029, viewed on 8 Feb 2013 (naming James Washington McConnico as his father). [S961] Find A Grave, online, above, memorial for Hester McConnico, memorial no. 98133471, viewed on 7 Apr 2017 (naming James Washington McConnico as his father). [S312] Social Security Death Index, online at http://tinyurl.com/AncestrySSDI, viewed on 20 Mar 1998. [S312] Social Security Death Index, online at http://tinyurl.com/AncestrySSDI, viewed on 20 Mar 1998 (giving only the month and year). Ada Queen's grave marker, Rice Cemetery, Rice, Tex., courtesy of Cynthia Glenn (McLendon). "KERENS, March 27 (Spl.)—Mrs. Ada Queen, 98, widow of the late J. F. Queen, died at her home here Monday afternoon following an extended illness. "Funeral services will be held from the First Baptist church, of which she was a member, Wednesday at 2 p.m., with burial in the Rice cemetery. The rites will be conducted by Rev. Dan Walker, pastor, and Willie Hamblin, minister of the Church of Christ. "Born, December 16, 1865, in Canton, Miss., she came to Texas in 1894 and resided at Rice until moving to Kerens in 1909. "Surviving are four daughters, Mrs. Ev Stanard, Kerens; Mrs. James J. Mabry, Conroe; Mrs. H. R. Warfield, Los Angeles, and Mrs. Albert Bishop, Dallas; two stepdaughters, Mrs. E. R. Washburn, Fort Worth, and Mrs. Minnie Bartlett, Dallas; three grandchildren and six great-grandchildren. [S9] Grave marker, Rice Cemetery, Rice, Tex. (common stone with J. F. Queen) (giving the year but no other information). [S440] Navarro County Cemetery Records, vol. 4 (Corsicana, Tex. : The Navarro County Gen. Soc'y, 1985), p. 83 (giving the year but no other information). [S1207] Corsicana Daily Sun, Corsicana, Tex., online archive at http://corsicana.newspaperarchive.com, 27 Mar 1962, p. 5, col. 5 (obituary of Mrs. Ada Queen). [S961] Find A Grave, online at http://www.findagrave.com, memorial for Ada Queen, memorial no. 10378804, viewed on 24 Feb 2014 (giving the year but no other information). [S586] Vicky Hutchings, Lebanon, Tenn., e-mail address, family group record for Merady Queen and Sarah Lavinia Summey sent to Roger Bartlett, 29 Aug 2000 (giving the date but not the place). [S9] Grave marker, Rice Cemetery, Rice, Tex. (common stone with J. F. Queen) (not giving the date). [S440] Navarro County Cemetery Records, vol. 4, above, p. 83 (common stone with J. F. Queen) (not giving the date). 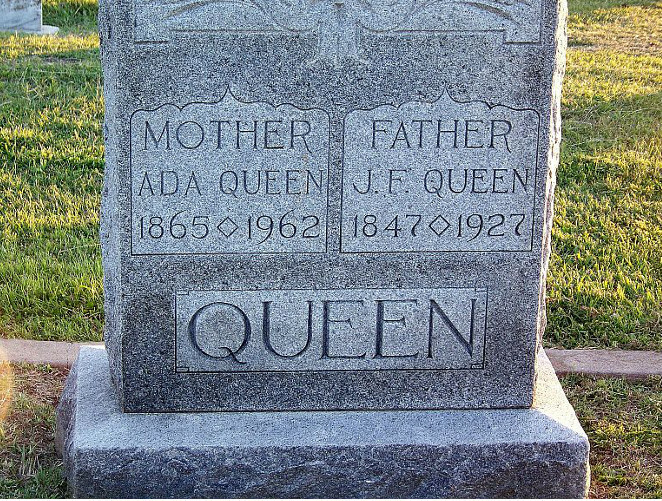 [S961] Find A Grave, online, above, memorial for Ada Queen, memorial no. 10378804, viewed on 24 Feb 2014. [S1207] Corsicana Daily Sun, Corsicana, Tex., online archive, above, 27 Mar 1962, p. 5, col. 5. [S440] Navarro County Cemetery Records, vol. 4, above, p. 83 (grave marker of Roy B. Queen, which states that he was the son of J. F. and A. F. Queen). J. F. Queen's grave marker, Rice Cemetery, Rice, Tex., courtesy of Cynthia Glenn (McLendon). [S9] Grave marker, Rice Cemetery, Rice, Tex. (common stone with Ada Queen) (giving the date but not the place). [S440] Navarro County Cemetery Records, vol. 4 (Corsicana, Tex. : The Navarro County Gen. Soc'y, 1985), p. 83 (giving the date but not the place). [S961] Find A Grave, online at http://www.findagrave.com, memorial for J. F. Queen, memorial no. 10378809, viewed on 24 Feb 2014 (giving the year but no other information). [S586] Vicky Hutchings, family group record for Merady Queen and Sarah Lavinia Summey, above (giving the date but not the place). [S9] Grave marker, Rice Cemetery, Rice, Tex. (common stone with Ada Queen) (not giving the date). [S440] Navarro County Cemetery Records, vol. 4, above, p. 83 (common stone with Ada Queen) (not giving the date). [S961] Find A Grave, online, above, memorial for J. F. Queen, memorial no. 10378809, viewed on 24 Feb 2014. [S1171] Peggy Morgan, charts and information sent to Roger Bartlett, 15 Oct 1992 (naming Jake F. Queen as her father). [S440] Navarro County Cemetery Records, vol. 4 (Corsicana, Tex. : The Navarro County Gen. Soc'y, 1985), p. 83 (grave marker of Roy B. Queen, which states that he was the son of J. F. and A. F. Queen). [S440] Navarro County Cemetery Records, vol. 4, above, p. 83. "D. A. Queen, 75 years old, died suddenly at the home of his son, L. R. Queen, at Long Beach, California at 5 o’clock Thursday morning, according to telegraphic information reaching here early today. 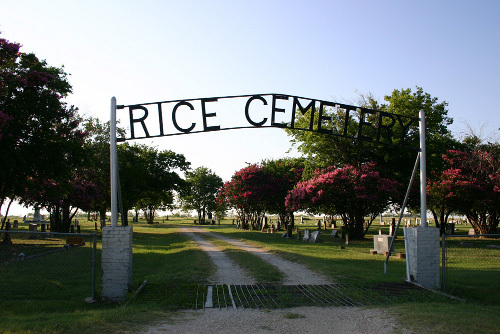 The body will be buried at Rice, former home of the deceased. Funeral announcements will be made later. "Mr. Queen, who was a resident of Rice for thirty-five years, recently made his home at Sherman with his daughter, Mrs. Charles Finley. He is survived by four sons, T. D. Queen, Rice; Meredith Queen, Kerens; L. R. Queen and W. T. Queen, Long Beach; two daughters, Mrs. W. J. Jones, Kerens, and Mrs. Finley, Sherman. He is also survived by one brother, J. F. Queen, Kerens. His wife died and was buried at Rice in 1920. "He went to bed last night hale and hearty as usual, took suddenly ill early this morning, and died within a few minutes. [S9] Grave marker, Rice Cemetery, Rice, Tex. (giving the date but no other information). [S187] Certificate of death (Texas Department of Health, Bureau of Vital Statistics) no. 63169 for Thomas David Queen, dated 12 Nov 1957, Mrs. C. T. Finney, informant, per copy provided by Texas Department of Health, Bureau of Vital Statistics, to Roger Bartlett on 10 Sep 1996, (stating that he was born in North Carolina without giving the date0. [S440] Navarro County Cemetery Records, vol. 4 (Corsicana, Tex. : The Navarro County Gen. Soc'y, 1985), p. 92 (giving the date but no other information). [S961] Find A Grave, online at http://www.findagrave.com, memorial for David A. Queen, memorial no. 69842701, viewed on 13 Feb 2012 (giving the date but no other information). [S586] Vicky Hutchings, family group record for Merady Queen and Sarah Lavinia Summey, above (not giving the date). [S738] Ellen Nelson, chart of descendants of Susan C. Bowden and Dave Queen sent to Roger Bartlett, 11 April 2002,(not giving the date). [S1076] 1900 U.S. Census, Navarro County, Tex., City of Corsicana, sheet 21, lines 92-93 (stating that they had been married twenty-six years). [S440] Navarro County Cemetery Records, vol. 4, above, p. 92 (giving the date but not the place). [S586] Vicky Hutchings, family group record for Merady Queen and Sarah Lavinia Summey, above (giving the date and erroneously stating that he died in Navarro County, Texas). [S9] Grave marker, Rice Cemetery, Rice, Tex. (common marker with Sue C. Queen). [S440] Navarro County Cemetery Records, vol. 4, above, p. 92 (common marker with Sue C. Queen). [S1207] Corsicana Daily Sun, Corsicana, Tex., online archive, above, 5 Jun 1924, p. 1, col. 4, with obvious typographical errors corrected (reprimted here with permission of Corsicana Daily Sun). [S1076] 1900 U.S. Census, Navarro County, Tex., City of Corsicana, sheet 21, line 92. [S187] Death certificate for Thomas David Queen, above, (naming David A. Queen as his father). [S738] Ellen Nelson, chart of descendants of Susan C. Bowden and Dave Queen, above,(naming Dave Queen as his father). [S1076] 1900 U.S. Census, Navarro County, Tex., City of Corsicana, sheet 21, line 94 (naming David Queen as his father). [S9] Grave marker, Rice Cemetery, Rice, Tex. (naming D. A. Queen as her father). [S440] Navarro County Cemetery Records, vol. 4, above, p. 92 (naming D. A. Queen as her father). [S738] Ellen Nelson, chart of descendants of Susan C. Bowden and Dave Queen, above,(naming Dave Queen as her father). [S440] Navarro County Cemetery Records, vol. 4 (Corsicana, Tex. : The Navarro County Gen. Soc'y, 1985), p. 92 (naming D. A. Queen as her father). [S9] Grave marker, Rice Cemetery, Rice, Tex. (naming S. C. Queen as her mother). [S440] Navarro County Cemetery Records, vol. 4, above, p. 92 (naming S. C. Queen as her mother). [S440] Navarro County Cemetery Records, vol. 4, above, p. 92. [S738] Ellen Nelson, chart of descendants of Susan C. Bowden and Dave Queen sent to Roger Bartlett, 11 April 2002,(naming Thomas Bowden as her father). [S187] Certificate of death (Texas Department of Health, Bureau of Vital Statistics) no. 63169 for Thomas David Queen, dated 12 Nov 1957, Mrs. C. T. Finney, informant, per copy provided by Texas Department of Health, Bureau of Vital Statistics, to Roger Bartlett on 10 Sep 1996, (stating that she was born in Tennessee without giving the date). [S738] Ellen Nelson, chart of descendants of Susan C. Bowden and Dave Queen, above,(giving the month and year but no other information). [S961] Find A Grave, online at http://www.findagrave.com, memorial for Sue C. Queen, memorial no. 69842649, viewed on 13 Feb 2012 (giving the date but no other information). [S586] Vicky Hutchings, Lebanon, Tenn., e-mail address, family group record for Merady Queen and Sarah Lavinia Summey sent to Roger Bartlett, 29 Aug 2000 (not giving the date). [S738] Ellen Nelson, chart of descendants of Susan C. Bowden and Dave Queen, above,(not giving the date). [S738] Ellen Nelson, chart of descendants of Susan C. Bowden and Dave Queen, above,(giving the month and year but not naming the place). [S11] Index to Texas Death Records (Austin, Tex. : Tex. Dept. of Health, Bur. of Vital Statistics), typescript, 1903-40, vol. 41, p. 20415, file 29769. [S9] Grave marker, Rice Cemetery, Rice, Tex. (common marker with David A. Queen). [S440] Navarro County Cemetery Records, vol. 4, above, p. 92 (common marker with David A. Queen). [S179] Rice Cemetery Association Directory, above (giving her name as Sue C. Queen). [S1076] 1900 U.S. Census, Navarro County, Tex., City of Corsicana, sheet 21, dwelling 436, family 489 (giving her name as Susie Queen). [S1076] 1900 U.S. Census, Navarro County, Tex., City of Corsicana, sheet 21, line 93. [S187] Death certificate for Thomas David Queen, above, (naming Sue Bowden as his mother). Other Names*: Aimee Bowie Fuller Smith Lane, Aimee Lane, Aimee Smith Lane. [S448] Handwritten transcript of Lane family bible in possession of Mrs. Lane Moffett, Dilley, Tex., copied by Mrs. John Casto on 28 Dec 1965, "Millett and Lane Family History" folder, box 2.325/F50, Millett (Tex.) Collection, Center for American History, University of Texas, Austin, Tex., (naming Amelia Margaret Bowie as her mother). [S510] Typewritten transcript of obituary of Mrs. Cleland N. Welch, copy in "Millett and Lane Family History" folder, box 2.325/F50, Millett (Tex.) Collection, Center for American History, University of Texas, Austin, Tex., attributed to The Dilley [Tex.] Herald, 26 Feb 1937, (naming Amelia Margaret Bowie as her mother). [S519] Carolyn Moffett, 4190 Wolf Springs Rd., Harrison, Ark. 72601, chart of descendants of Harold Clifton Lane, Sr. sent to Roger Bartlett, 8 Nov 1999, (naming Amelia Bowie as her mother). [S448] Handwritten transcript of Lane family bible, above, (naming Hon. Joseph Emerson Smith as her father). [S510] Typewritten transcript of obituary of Mrs. Cleland N. Welch, above, (naming Joseph Emerson Smith as her father). [S519] Carolyn Moffett, 8 Nov 1999 chart, above, (naming Joseph Smith as her father). [S449] Undated notes, "Millett and Lane Family History" folder, box 2.325/F50, Millett (Tex.) Collection, Center for American History, University of Texas, Austin, Tex. (giving Dilley, Tex. cemetery records). [S961] Find A Grave, online at http://www.findagrave.com, memorial for Aimee Bowie Lane, memorial no. 66181948, viewed on 1 May 2016. [S448] Handwritten transcript of Lane family bible, above, (naming Aimee Bowie as her mother). [S448] Handwritten transcript of Lane family bible, above, (naming Aimee Lane as her mother). [S519] Carolyn Moffett, 8 Nov 1999 chart, above, (naming Aimee Bowie Fuller Smith as his mother). 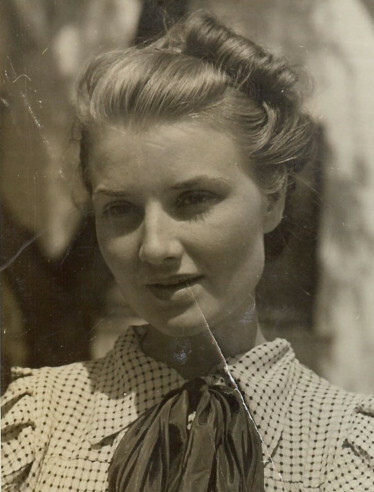 Marriage*: He married Louella Jacobs. [S961] Find A Grave, online at http://www.findagrave.com, memorial for Colberta Davidson Millett, memorial no. 16220904, viewed on 10 Feb 2012 (naming William M. Davidson as her father). [S961] Find A Grave, online, above, memorial for Colberta Davidson Millett, memorial no. 16220904, viewed on 10 Feb 2012 (naming Jane Coldwell as her mother). [S449] Undated notes, "Millett and Lane Family History" folder, box 2.325/F50, Millett (Tex.) Collection, Center for American History, University of Texas, Austin, Tex. (citing "record of burials by the city sexton," n.p., that she was buried on Nov. 11, 1940 at age 75). [S961] Find A Grave, online, above, memorial for Colberta Davidson Millett, memorial no. 16220904, viewed on 10 Feb 2012. [S961] Find A Grave, online, above, memorial for Colberta Davidson Millett, memorial no. 16220904, viewed on 10 Feb 2012 (not giving the date or place). [S961] Find A Grave, online, above, memorial for Capt. Alonzo Millett, memorial no. 59095011, viewed on 10 Feb 2012 (not giving the date or place). [S1375] The Fort Worth Daily Gazette, Fort Worth, Tex., online at http://www.newspapers.com, 7 Jul 1887, p. 2, col. 4. [S449] Undated notes, "Millett and Lane Family History" folder, above (citing "record of burials by the city sexton," without naming the city or otherwise identifying the sexton's jurisdiction, that she was buried on 11 Nov 1940). [S11] Index to Texas Death Records (Austin, Tex. : Tex. Dept. of Health, Bur. of Vital Statistics), typescript, 1903-40, vol. 35, p. 17305, file 48902. [S178] Stanley D. Casto and Eva M. Casto, comps. and eds., Settlers of the Millett Community 1881-1981 (n.p. : n.pub., 1981), p. 29 (giving the place but not the date). [S449] Undated notes, "Millett and Lane Family History" folder, above (citing "record of burials by the city sexton," without identifying the city: "The records for 1940 indicate that Mrs. Colberta D. Millett, age 75 years, was buried in City Cemetery # 1 Lot 53 Sec. A, in the plot purchased by A. Millett, on Nov. 11, 1940"). [S961] Find A Grave, online, above, memorial for Colberta Davidson Millett, memorial no. 16220904, viewed on 10 Feb 2012 (stating that her grave marker is no longer there). [S454] Typewritten summary of interview with Mrs. George Sanders, 8 Aug 1965, "Millett and Lane Family History" folder, box 2.325/F50, Millett (Tex.) Collection, Center for American History, University of Texas, Austin, Tex., (recounting memories of Colberta Millett). [S916] John Stovall, electronic mail to Roger Bartlett, 1 Jan 2004, (describing visit to City Cemetery No. 1). [S961] Find A Grave, online, above, memorial for Alonzo Hiram Millett, memorial no. 47790490, viewed on 10 Feb 2012 (naming Colberta Davidson Millett as his mother). [S961] Find A Grave, online, above, memorial for Colberta Davidson Millett, memorial no. 16220904, viewed on 10 Feb 2012 (naming Colberta Davidson Millett as his mother). Note*: A visitor to the cemetery in October 2012 was unable to find a grave marker for him. [S1232] San Antonio Light, San Antonio, Tex., 12 Sep 1911 (obituary of Alonzo Millett) (naming Capt. Alonzo Millett as his father). [S961] Find A Grave, online at http://www.findagrave.com, memorial for Alonzo Hiram Millett, memorial no. 47790490, viewed on 10 Feb 2012 (naming Capt. Alonzo Millett as his father). [S961] Find A Grave, online, above, memorial for Capt. Alonzo Millett, memorial no. 59095011, viewed on 10 Feb 2012 (naming Capt. Alonzo Millett as his father). [S961] Find A Grave, online, above, memorial for Alonzo Hiram Millett, memorial no. 47790490, viewed on 10 Feb 2012. [S1232] San Antonio Light, San Antonio, Tex., 12 Sep 1911 (obituary of Alonzo Millett) (not giving the date, but stating that he was twenty-two years old when he died on 11 Sep 1911 and was born in San Antonio, Texas). [S11] Index to Texas Death Records (Austin, Tex. : Tex. Dept. of Health, Bur. of Vital Statistics), typescript, 1903-40, vol. 35, p. 17305, file 19151. [S1232] San Antonio Light, San Antonio, Tex., 12 Sep 1911 (obituary of Alonzo Millett). [S1232] San Antonio Light, San Antonio, Tex., 12 Sep 1911. Other Names*: Martha Ham Fortson, Martha Fortson. [S182] John H. McIntosh, The Official History of Elbert County [Ga.] 1790-1935 (Atlanta, Ga.: Cherokee Pub. Co., 1968), p. 255 (date and place) (citing to Marriages, 1836-1850, Elbert County, Ga., p. 164). The original edition was published at Elberton, Georgia in 1940, and the 1968 edition includes a 1935-1939 supplement by the Stephen Heard Chapter of the Daughters of the American Revolution, Elberton, Georgia. [S182] John H. McIntosh, The Official History of Elbert County, above, p. 434 (chart of descendants of James Hailey and Ann Elnora Cloud) (no date or place). [S773] E. A. Ferguson, electronic mail to e-mail address, 24 Sep 2002, (naming Martha Ham as her mother). Obituary*: "DEATH OF MRS. FORTSON. "Washington, Ga., Aug. 24 .—Mrs. Mary Fortson, widow of the late Benjamin Fortson, died Thursday morning at the family estate in Lincoln County. 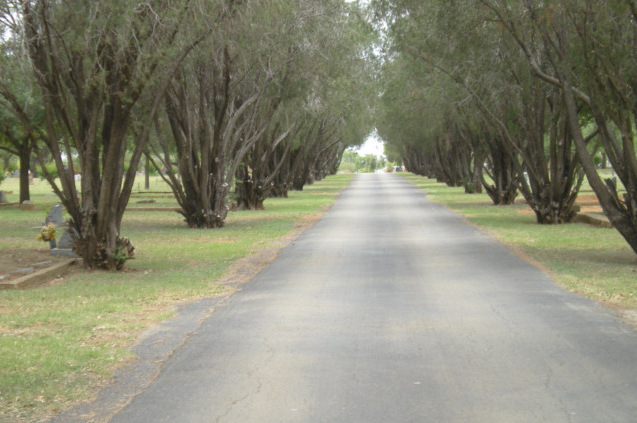 The interment was at Pine Grove Cemetery the following day, conducted by Rev. J. L. Franklin. Note*: • Her obituary in the Augusta Chronicle says she was seventy-four years old at her death, but her birth date was 6 Jan 1840 and her death date was 22 Aug 1912, making her seventy-two years old at death. [S1281] The Augusta Chronicle, Augusta, Ga., 25 Aug 1912, p. 2 (obituary of Mrs. Mary Fortson) (naming Col. Ned Jones as her father). [S961] Find A Grave, online at http://www.findagrave.com, memorial for Mary J. Fortson, memorial no. 89449793, viewed on 10 Oct 2013. [S182] John H. McIntosh, The Official History of Elbert County [Ga.] 1790-1935 (Atlanta, Ga.: Cherokee Pub. Co., 1968), p. 434 (chart of descendants of James Hailey and Ann Elnora Cloud) (not giving the date or place but stating that she was his second wife). The original edition was published at Elberton, Georgia in 1940, and the 1968 edition includes a 1935-1939 supplement by the Stephen Heard Chapter of the Daughters of the American Revolution, Elberton, Georgia. [S1281] The Augusta Chronicle, Augusta, Ga., 25 Aug 1912, p. 2 (obituary of Mrs. Mary Fortson) (referring to her as "widow of the late Benjamin Fortson"). [S961] Find A Grave, online, above, memorial for Benjamin Fortson, memorial no. 89449601, viewed on 10 Oct 2013. [S1281] The Augusta Chronicle, Augusta, Ga., 25 Aug 1912, p. 2 (obituary of Mrs. Mary Fortson). [S961] Find A Grave, online, above, memorial for Mary J. Fortson, memorial no. 89449793, viewed on 10 Oct 2013 (not giving the date). [S1281] The Augusta Chronicle, Augusta, Ga., 25 Aug 1912, p. 2. [S961] Find A Grave, online, above, memorial for Mary J. Fortson, memorial no. 89449793, viewed on 10 Oct 2013 (stating that she died on 20 Aug 1912) (second bullet). [S1281] The Augusta Chronicle, Augusta, Ga., 25 Aug 1912, p. 2 (first bullet). [S961] Find A Grave, online, above, memorial for Mary J. Fortson, memorial no. 89449793, viewed on 10 Oct 2013 (giving 6 Jan 1840 as her birth date) (first bullet). [S1281] The Augusta Chronicle, Augusta, Ga., 25 Aug 1912, p. 2 (giving 22 Aug 1912 as her death date) (second bullet). [S773] E. A. Ferguson, electronic mail to e-mail address, 24 Sep 2002, (naming Benjamin F. Fortson as her father). [S182] John H. McIntosh, The Official History of Elbert County [Ga.] 1790-1935 (Atlanta, Ga.: Cherokee Pub. Co., 1968), p. 434 (chart of descendants of James Hailey and Ann Elnora Cloud). The original edition was published at Elberton, Georgia in 1940, and the 1968 edition includes a 1935-1939 supplement by the Stephen Heard Chapter of the Daughters of the American Revolution, Elberton, Georgia. [S833] Earl Ferguson, electronic mail to e-mail address, 15 Feb 2003. [S773] E. A. Ferguson, electronic mail to e-mail address, 24 Sep 2002, (naming Sarah Allen Fortson as her mother). [S833] Earl Ferguson, electronic mail to e-mail address, 15 Feb 2003, (giving the date but not naming the place). [S773] E. A. Ferguson, electronic mail to e-mail address, 24 Sep 2002, (naming William Thomas Murray as her father). [S182] John H. McIntosh, The Official History of Elbert County, above, p. 434 (chart of descendants of James Hailey and Ann Elnora Cloud) (giving the date but not the place). Birth*: She was born on 17 March 1829. Death*: She died on 20 July 1871 at age 42. Other Names*: Elizabeth Prather, Elizabeth Catherine Prather Fortson, Elizabeth Prather Fortson, Elizabeth Catherine Fortson, Elizabeth Fortson. [S182] John H. McIntosh, The Official History of Elbert County [Ga.] 1790-1935 (Atlanta, Ga.: Cherokee Pub. Co., 1968), p. 434 (chart of descendants of James Hailey and Ann Elnora Cloud) (supposition as to date, based on children's birth dates). The original edition was published at Elberton, Georgia in 1940, and the 1968 edition includes a 1935-1939 supplement by the Stephen Heard Chapter of the Daughters of the American Revolution, Elberton, Georgia. [S111] Supposition as to date, (based on children's birth dates). [S27] John Wright Boyd, A Family History: Lt. Thomas Fortson (1742-1824) and Some of His Descendants—Early Settler of Elbert County, Georgia (Danielsville, Ga.: Heritage Papers, 1973), p. 88 (naming Elizabeth Catherine Prather as his mother). Birth*: She was born on 13 April 1851. Death*: She died on 13 August 1883 at age 32. [S111] Supposition as to date, (based on believed birth order). [S182] John H. McIntosh, The Official History of Elbert County [Ga.] 1790-1935 (Atlanta, Ga.: Cherokee Pub. Co., 1968), p. 435 (chart of descendants of James Hailey and Ann Elnora Cloud). The original edition was published at Elberton, Georgia in 1940, and the 1968 edition includes a 1935-1939 supplement by the Stephen Heard Chapter of the Daughters of the American Revolution, Elberton, Georgia. [S930] Elbert County Cemeteries, Vol. 1 (n.p. : n.pub., 2002), pp. 669 (stating that he was the husband of Tallulah Hill), 670 (stating that she was the wife of George Thomas Fortson). [S182] John H. McIntosh, The Official History of Elbert County, above, p. 435 (chart of descendants of James Hailey and Ann Elnora Cloud) (giving 19 May 1918 as his death date). [S929] Early Cemeteries and Gravestones Elbert County, Georgia (Elberton, Ga.: Elbert County Hist. Soc'y, 1874), p. 14 (giving 1849 as his birth date). [S931] Ann Clark Holloman, comp, Elbert County, Georgia Death Records 1875-1876 and 1919-1995 (Albany, Ga.: Ann Clark Holloman, 1997), p. 56, certificate no. 4761 (stating that she was ninety-seven years old when she died on 9 Oct 1946). [S931] Ann Clark Holloman, comp, Elbert County, Georgia Death Records 1875-1876 and 1919-1995 (Albany, Ga.: Ann Clark Holloman, 1997), p. 56, certificate no. 4761.